Police release photographic proof that terrorist who stabbed policeman exploited presence of journalists to commit terror attack. 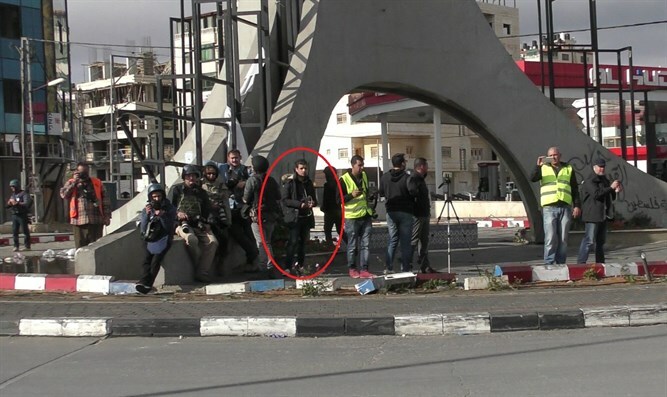 Israeli police released photographs Sunday proving that the terrorist who stabbed an Israeli Border Police officer near Ramallah on Friday hid among a group of photographers and journalists who were covering an Arab riot before carrying out the attack. The investigation into the attack revealed that the terrorist had hid among the journalists for about a half-hour prior to the attack, exploiting the media presence to get close to the officers and attack them. The police released a statement: "We have seen in recent days the cynical and destructive exploitation of the presence of journalists and and emergency teams in an attempt to harm the soldiers and police operating in complex arenas. We emphasize that this type of incident does not change the police policy that will continue to allow coverage of events to the fullest extent possible. However, we view any attempt to abuse this policy with the utmost seriousness."